Have you ever tried Thai tea? 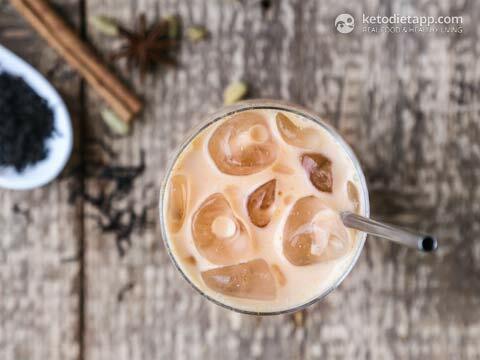 It's a refreshing beverage made with Thai tea mix, sugar and sweet condensed milk. The traditional version may be delicious but it's not particularly healthy. 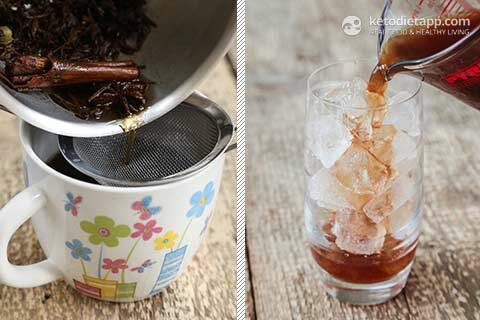 The good news is that you can easily make it with black tea, spices and cream or coconut milk, or even keto condensed milk which I also used to make Vietnamese Iced Coffee. The reason I didn't use Thai tea blend is because it contains dyes which I avoid. Apart from the condensed milk, I didn't add any sweetener. If you're using cream or coconut milk, you may need to add some Erythritol or stevia. Macronutrient ratio: Calories from carbs (9%), protein (4%), fat (87%). Nutrition facts do not include spices that are only used for infusing. Prepare the Keto Condensed Milk in advance. 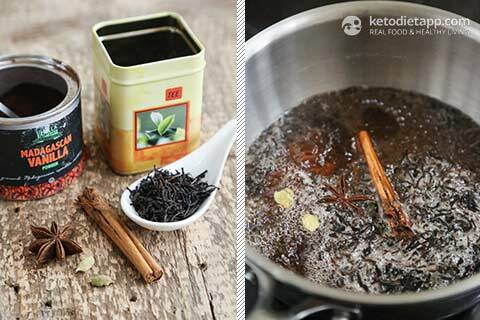 Bring 4 cups of water to a boil and add the tea, star anise, cardamom pods, cloves, cinnamon stick and vanilla powder (or whole vanilla bean cut lenghtwise). Boil over a medium heat for 2-3 minutes. Take off the heat and let it sit for 30 minutes. Strain the tea leaves and spices and discard them. Stir in the Erythritol (if used) and let the tea mix cool completely before serving. I keep it in the fridge until ready to be served. It will last for up to a week. 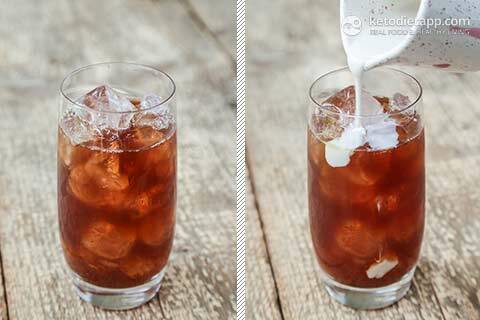 To serve, fill a glass with ice and pour in the tea mix. 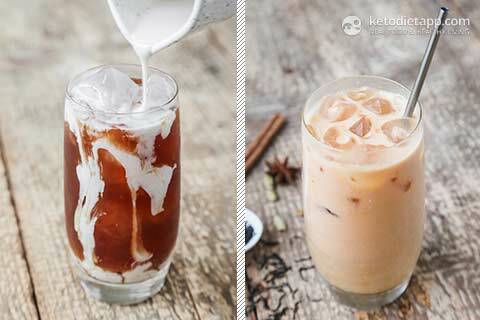 Pour in Keto Condensed Milk (2 tablespoons per glass, or more to taste) or cream or coconut milk. Stir or drink without stirring. Enjoy! I'm thinking this would work with coffee as well?? I love your blog and the fact that it is truly documented. I had one question regarding this recipe. I tried to make it last night. The condensed milk turned out great, however the tea became very bitter after letting it sit for half an hour with the tea leaves and everything else in it. I tried to dilute it, however it was still extremely bitter. Do you think I should strain it right after taking it off the stove? Also, when I put together the Thai Iced tea, in contact with the liquid and ice cubes, the condensed milk started changing it's consistency in small white particles and didn't look like in your pics. I'm wondering what went wrong?! Hi Anca, I think it might be better to just leave the black tea in for 3-5 minutes (if using tea bags, it will be easy to remove) and leave the remaining ingredients in for another 20-25 minutes. Wonderful concoction! 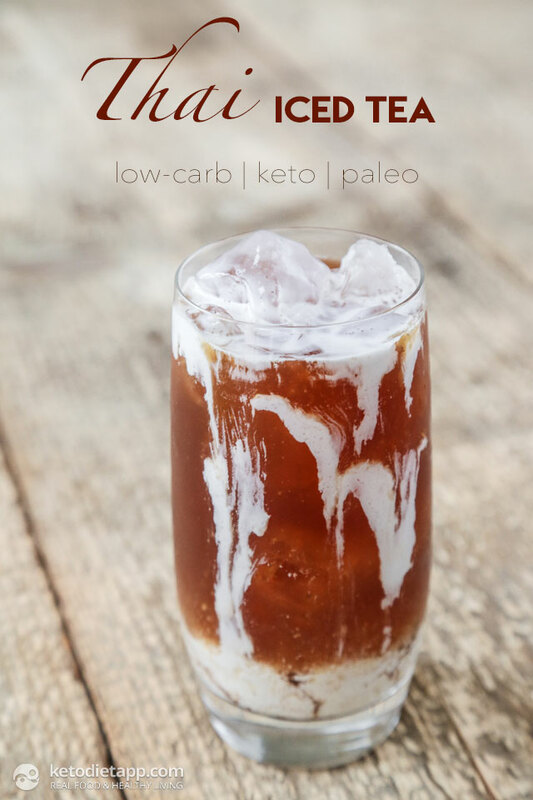 I'm curious: are the net carbs and calories in this recipe mostly the result of the keto milk (if included in the nutritional values), or do the flavours from the spice, pods and extracts actually leave enough residue behind to raise the nutritional content of the finished drink? Thank you Jonas! It's mostly the condensed milk, the spices used for infusion have a negligable effect. Hi...I'm trying to understand the differences in the diets. How is Keto different from Primal? Both are high fats, moderate protein and low carbs. Great blog, BTW. Well resourced. Well done. Martina, are cultured and fermented dairy still considered "dairy?" For example, yogurt and kefir. Yes, it is still dairy  You can use it is you are not allergic/ intolerant to it. LOL, that is where I started! YOU (hurrah!) are the first person I've read that identified the difference. All the paleo/primal writers refer to primal this way: paleo food, primal lifestyle. I was so glad to see a difference distinguished! * Keto: high-fat, moderate protein, low-carb diet. Conventionally sourced meat/veggies/fruit, artificial sugars, processed oils, diary optional. * Paleo: high in protein, moderate in fat and low in carbs. Pastured meat, organic veggies/fruit, natural sweeteners, natural oils (coconut, avocado, olives), no diary, no legumes, no grains. * Primal: high-fat, moderate protein, low-carb diet. (Guessing...) Pastured meat, organic veggies/fruit, natural sweeteners, natural oils from fruits (coconut, avocado, olives), no diary, no legumes, no grains. If I'm right...primal is keto with better sourced foods? I'm still trying to figure out how one gets all that fat in their diet. Oh...here's a typo in Start Here: "full-fat cream and yogurt in you diet plan." Keto doesn't have to include artificial sweeteners and processed foods... let's just say that this varies for individual diets. The truth is that some people following a keto diet use artificial sweeteners and eat low-carb junk but many people eat healthy. Compared to primal and paleo approach, keto is typically very low in carbs (5-10% of calories from carbs as compared to paleo and primal 20-30%). Paleo: high in protein, moderate in fat and low in carbs. It does not include dairy. Primal: high-fat, moderate protein, low-carb diet. Primal approach does allow full-fat raw dairy (butter, cream, cheese). Thank you for helping me understand! I would add unsweetened coconut milk to this delicious recipe! YUM! Hello! I am interested in trying this but the link for the vanilla powder is unavailable on Amazon. Do you recommend a substitute or another brand? Thank you for noticing, I just updated the link to a product that is available.